A law suit was filed in US District Court in North Carolina on January 9, 2010, on behalf of Pace Airlines. The Judge hearing the case, case No. 09-52426 is Thomas Waldrep Jr., a U.S. Bankruptcy Court Judge for the Middle District of North Carolina. Judge Waldrep has continued Wednesday’s court hearing and will consider how to best handle the failed charter airline and Jet Maintenance Company. Back on September 12, 2009, Pace Airlines laid off more than four hundred employees and many of these employees had not been paid. The Department of Labor began an investigation on wage and employee complaints. That same week the company’s Vice President's car was vandalized and as a result more than one hundred additional employees were laid off. Pace Airlines believed the vandalism was in retaliation to earlier layoffs that week. Pace Airlines CEO William C. Rodgers was released from jail September 22, 2009 after being arrested on charges of knowingly canceling health insurance on employees. Rodgers was arrested at Piedmont Triad International Airport by investigators with the North Carolina Department of Insurance. Investigators said Rodgers knowingly canceled his employee group health insurance without providing the required 45 day notice to his 337 employees. Rodgers was charged with one count of willful failure to pay group health insurance premiums. Pace Airlines filed a law suit in September 2009, the suit claimed Direct Air failed to pay $1.45 million for flight services it provided in the spring. Direct Air reported the lawsuit is a result of the companies decision to cancel its contract with Pace for the reason that Pace Airlines did not provide the type of aircraft it agreed to provide as stated in their agreement, both sides claiming the other failed to live up to contract agreements. The District Court will determine how best to handle the numerous claims Pace Airlines. Several groups have file claim against the company; AeroUSA Inc, TW Telecom Inc, Global USA Holdings Inc, Airport Commission of Forsyth County, Piedmont Aviation Services LLC, Triton Aviation Services Ltd, GE Money and over 400 employees past and present. From Pace Airlines to Hooters Air then back to Pace Airlines. In late December of 2002, the owner of Hooters, Robert H. Brooks, was interested in purchasing an airline. He first approached bankrupt Vanguard Airlines of Kansas City, MO. They rebuffed his offer to buy their assets, so he turned his eye toward Winston-Salem and Pace Airlines. He purchased the company in late December 2002, and began laying the groundwork to bring a new airline to Myrtle Beach, SC. With a former executive of Vanguard, he formed Hooters Air using the Hooters identity as the draw to attract passengers. Hooters Air offices were headquartered in Myrtle Beach, while the operations/maintenance/flight personnel directly controlled by Pace Airlines remained largely based in Winston-Salem in the former Piedmont/USAirways Tom Davis Training Center. 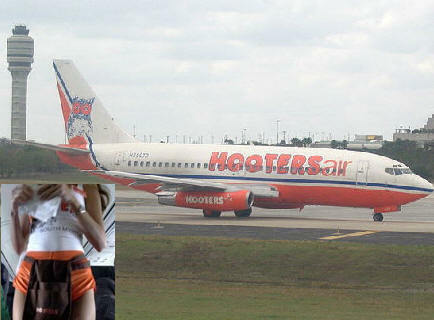 Hooters Air began service in April of 2003 with daily flights between ATL-MYR and BWI-MYR utilizing B737-200s. Gradually EWR, CMH, LCK, GYY, PIT, RSW, and NAS (Nassau) were added. Service to Gary, IN (GYY) operated as direct service from MYR with a stopover in Columbus, OH (LCK). Gary was marketed as service to Chicago, as the drive time to downtown Chicago was quicker than from ORD. The aircraft utilized for Hooters were N250TR (B732), N252TR (B732), N371PA (B733), N370WL (B733), N380WL (B733), and N750WL (B752). The fall of 2004 was spent preparing the airline for 180 ETOPS with the 757-200. Plans were to possibly run vacation charters to Hawaii from the West Coast. Proving flights were operated between OAK-HNL. Authorization was granted in November of 2004, but never put into service with Vacation Express. In February 2005, a decision was made to inaugurate Hooters Air service from Rockford, IL (RFD) to Denver (DEN) and Las Vegas (LAS). The flights from RFD were guaranteed profitability from the local Airport Authority in the form of route subsidies. Non-stop service between MYR-LAS utilizing the 737-300 was studied several times, but never started. For a period of time in 2005, there were also RFD-ATL nonstop flights. The summer of 2005 saw a huge spike in oil prices, a direct result of speculation in the run-up and aftermath of Hurricanes Katrina and Rita. This upward surge in jet fuel prices, combined with competition from United Airlines (also given subsidies) resulted in the termination of service to Rockford in December 2005. In August of 2005, Hooters Air also began non-stop service between Allentown (ABE) and St Petersburg Clearwater, FL (PIE), and also Ft Lauderdale (FLL). These flights only lasted a few months as the carrier ran into difficult times. Once a promising concept, Hooters Air succumbed to the fate of most start up airlines since deregulation and ceased operations in the spring of 2006. The certificate holder Pace Airlines fell back to their core business of providing sports and vacation charter flights. Pace Airlines is an American charter airline based in Winston-Salem, North Carolina, USA. It operates executive passenger and sports flight charters. Its main base is Smith Reynolds Airport, Winston-Salem. The airline was established in January 1996 and started as Pace Airlines after Piedmont Aviation Services was granted Federal Aviation Administration and United States Department of Transportation approval on March 26, 1996. The first General Manager of Pace was Jerry Angel, formerly of Piedmont Airlines (1948–1989) and later Leisure Air. The first aircraft on certificate was N487GS, a 737-200 previously of Western Airlines and Viscount, owned by the NBA Charlotte Hornets. The initial business model was executive charter service for primarily sports teams and businesses in a 44 seat all first-class configuration. Quickly 3 more aircraft were added to the certificate, N9075U, N159PL, and N37NY. Piedmont Aviation Services was merged with Hawthorne Aviation in July 1998 and became Piedmont Hawthorne Aviation. PHA was owned by the Carlyle Group located in Washington, DC. In January 2000 Mr. Darrell Richardson was recruited as the new President of Pace Airlines. Mr. Richardson had been Chief Operating Officer of Mesaba Airlines since 1995. Immediately, Mr. Richardson began to grow the airline. This saw the first major contract for the company, with Vacation Express out of ATL to operate 6 737-300s. N371PA, 372, 373, 374, 375, and 377. This was a very successful operation. Operating out of cities such as BWI, IAD, CVG, IND, SDF, CLT and ATL to a hub in Orlando Sanford SFB, where flights continued on to SXM, PUJ, CUN, LIR, and MBJ. As a 'scheduled charter' carrier, these flights operated 5 days per week. The first flights for Vacation Express by Pace were launched on Thanksgiving Day, 2001. Pace Airlines, Inc. was sold to Pace Airlines, LLC & Pace Airlines II, LLC in December 2002, which became the parent company of Pace Airlines, Inc. Additional aircraft were added over the years, mainly 737-200s and a handful of 757-200s. Contracts came for such city pairs as JFK-POS (752) and MBS-LBX (732). In August 2009, Pace Airlines maintenance division lost a major contract with Continental Airlines. In December 2007, Pace Airlines was granted a contract with Continental Airlines to perform heavy maintenance checks on some of Continental's 737-300 and 500 aircraft as well the company provided installation work for avionics equipment.